Weight management and healthy eating are issues that wellness professionals face every day with their clients. However, nutritionists, wellness coaches and personal trainers need to look beyond the meal tray to fully understand the factors that contribute to their client’s situation. Let’s see what a quick internet search brings up on the connection between different lifestyle components and weight management. A commentary published in the Canadian Medical Association Journal showed that “an accumulating body of evidence suggests that sleeping habits should not be overlooked when prescribing a weight-reduction program to a patient with obesity.” In another study, presented at a meeting of the American Academy of Sleep Medicine and Sleep Research Society, researchers showed that not getting enough sleep can affect our resistance and ability to say ‘no’ to unhealthy foods. A review by David G. Davila reminds that even if diet and exercise are critical components of a healthy lifestyle, it’s also important to realize that sleep is inherently linked to how we eat, how we exercise, whether or not we lose weight, and how we function on a daily basis. In everyday terms, if we don’t eat well (enough, nutritiously, at regular intervals), it’s harder to stay energetic and cope with the stress that life throws at us, and if we don’t cope well with stress, it tends to affect our sleep. 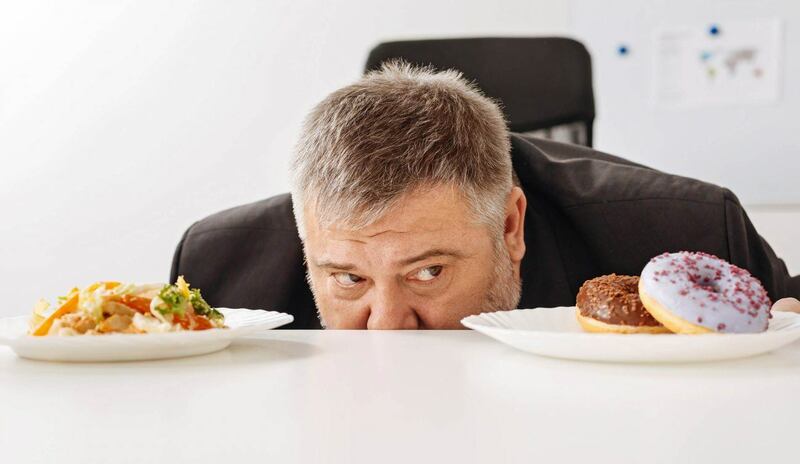 Or from another starting point, if our stress level is persistently high, we are much more likely to make bad food decisions – skip meals or grab some quick ‘comfort food’ to get a temporary lift. A high daytime stress level also hurts our ability to sleep well, which keeps the vicious circle spinning: we will be too tired the next day to stick to a healthy diet. A multidisciplinary approach is routine for most wellness professionals. An understanding of the client’s eating habits is important for a fitness coach to be able to provide meaningful exercise guidelines, just like data about sleep and exercise can be hugely beneficial to a nutrition coach. 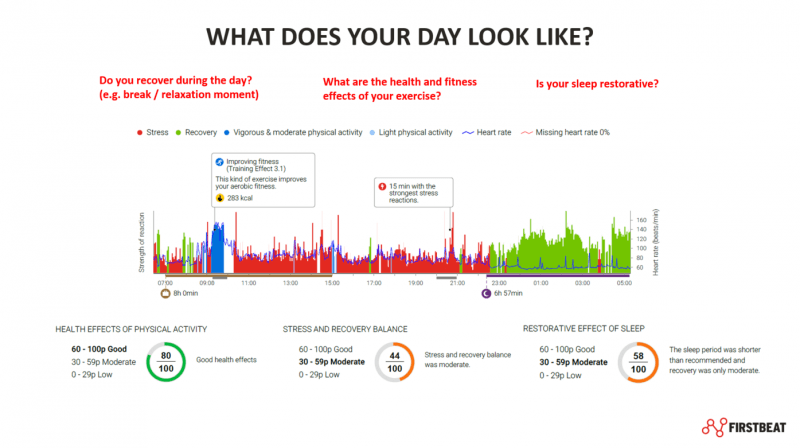 Firstbeat Lifestyle Assessment is a 3-day heart rate variability measurement that allows the coach to get a peek at what’s going on inside the client’s body: how they are dealing with daily stress, what helps them recover, and how exercise fits into their lifestyle (Figure 1 below). Lifestyle Assessment can be used as a baseline measurement in coaching, to identify the clients’ challenge areas and strengths before making a plan to improve their nutritional status, lose weight in a sensible way, or improve their overall fitness. The ‘hidden’ information that this type of assessment can reveal allows the coach to fine-tune their recommendations towards better health and well-being in the long run. It also helps the client to see how their behaviors affect their physiology, and use that information to make behavioral changes that can impact their body and mind in a positive way. For example, if the measurement shows that it takes the client several hours before they start getting good-quality sleep after going to bed, the initial nutritional focus might be on the types of foods and drinks that should be avoided versus favored in the hours before bed. Or if the result shows problems with the overall stress-recovery balance, it can be used to remind a weight management client that weight loss is significantly harder when we are stressed and tired – and then focus not only on nutritional solutions, but also on practical strategies to reduce stress and improve sleep. Or if the client exercises a lot, at high intensity, making sure that they get enough high-quality calories to sustain performance. Figure 1. 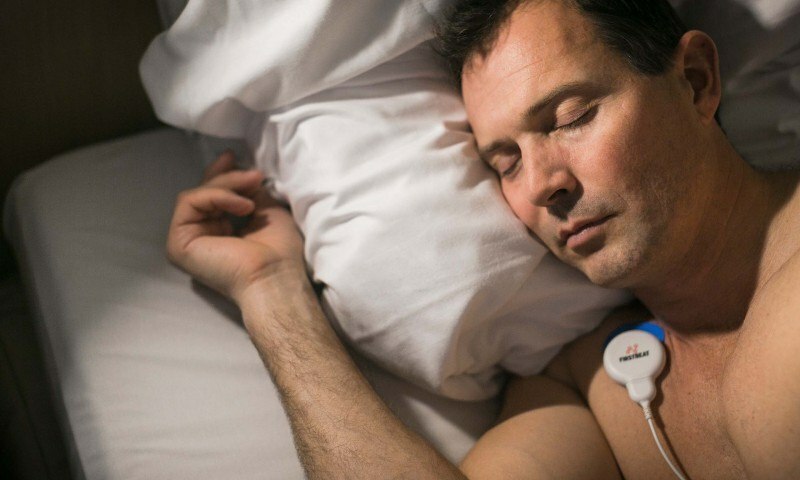 Firstbeat Lifestyle Assessment looks at the balance between stress and recovery, sleep and exercise as important pillars of a healthy lifestyle. An understanding of these factors can help a nutrition coach make sensible, personalized nutritional plans. Figure 2. 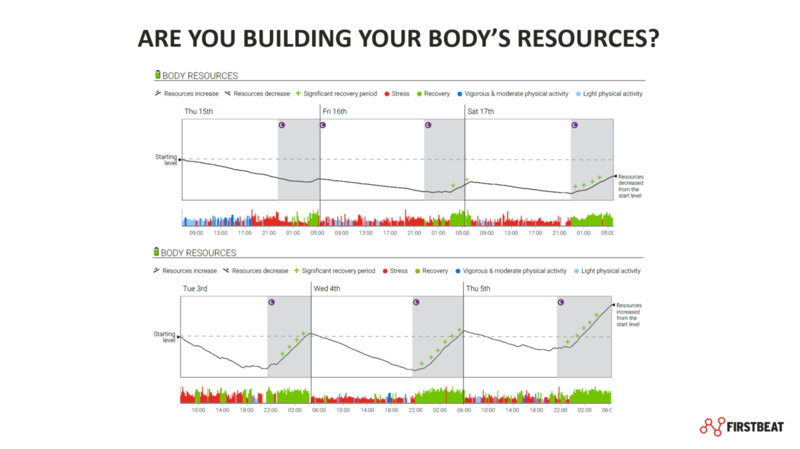 The Body Resources graph provides a visual representation of whether we are depleting (top) or recharging (bottom) our battery, by looking at the balance between stress and recovery over 24h periods. Strategies for better sleep, effective stress management and healthier eating can help the client improve this balance. There is no one-size-fits-all prescription for wellness and good health, nor for a healthy diet, but better understanding of the client’s life situation is a good starting point for any coaching relationship. 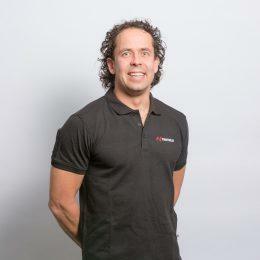 As professionals in different disciplines, we should naturally focus on our core area and skillset, yet take advantage of additional technology and multidisciplinary approaches or teams to broaden our expertise and provide the client deeper insights towards better health and sustainable lifestyle change. 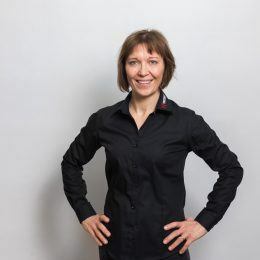 Tiina is an Exercise Physiologist who works at Firstbeat as a Wellness Specialist. Growing up as a skier, Tiina spent 4 years cross-country ski racing and later 4 year coaching at the University of Alaska, Anchorage. 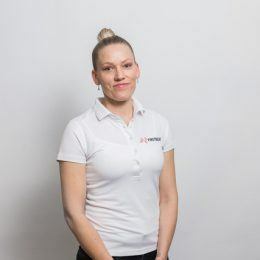 After moving back to Finland, she found her way to Firstbeat after several years in overtraining and heart rate variability field studies at the Research Institute for Olympic Sports and the University of Jyväskylä. To maintain a good balance in her own life, she enjoys the outdoors – kayaking, hiking, xc-skiing and escaping to her cabin in the woods. Applying Supercompensation in Life: How to Turn Stress into Resources? 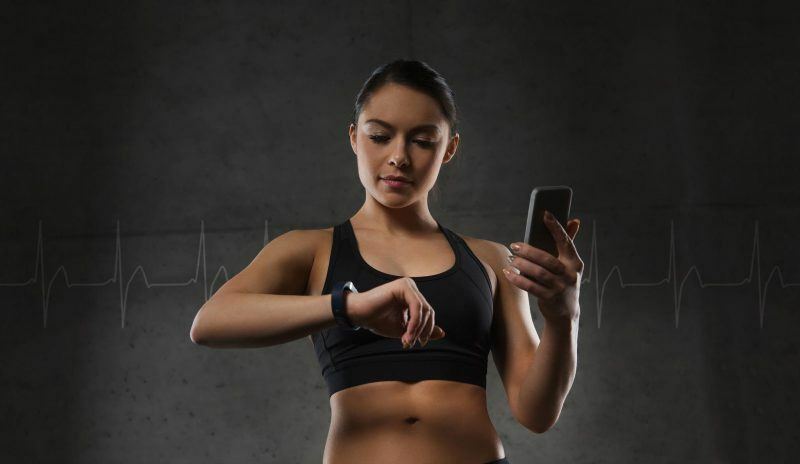 Heart rate variability (HRV) is the physiological phenomenon of variation in the time interval between consecutive heartbeats. The level of HRV varies a lot between individuals, but in general terms, high HRV is viewed as a marker of good fitness and health.